Wenningstedt is a village situated next to Westerland and is a quiet, peaceful health and holiday resort. The distance to the main town of the island, Westerland is great enough to neglect it´s frantic pace but small enough to make use of all possibilities the town provides. 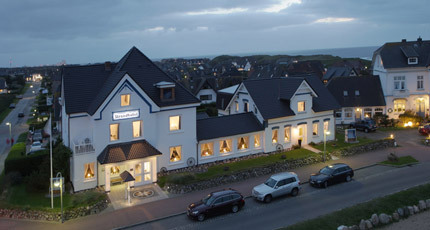 Strandhotel ("Strand" means in English "beach") in Wenningstedt is located in the center of the village and it is very close to the beach, you can walk there in less than five minutes, nevertheless it is situated in the center of the village. Nearby there are a couple of good restaurants where you can get something for every taste at any time of the day. You can reach the public transportation only 150 meters down the street.